Pair the Garmin Forerunner 235 GPS Run Watch with Integrated HRM with your smartphone and get audio prompts based on your own training plan to help you stay on track. The 235 also features live tracking and smart notifications. 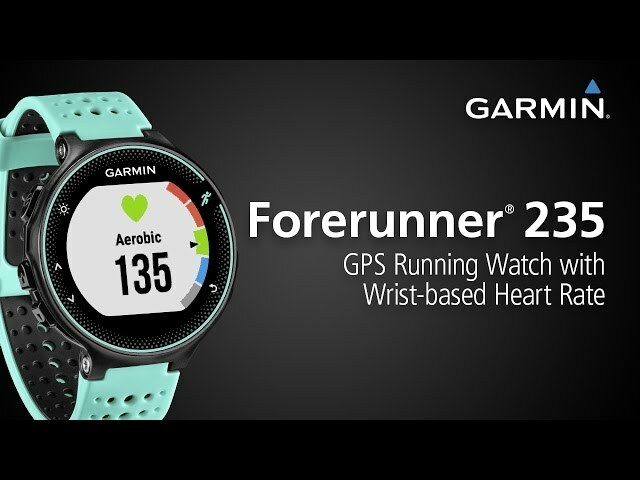 Garmin Forerunner 235 GPS Run Watch with Integrated HRM is rated 4.6 out of 5 by 147. Rated 5 out of 5 by ChrisRunner from Excellent Training Aid and General Health tracker Fantastic watch! The combination of GPS & GLONASS provides accurate tracking, as does the the heart rate monitor which helps you run in set effort zones. Being able to upload tricky and bespoke marathon training plans from Garmin Connect directly to the watch has been of massive benefit to me. I paid extra for next day delivery and the watch was tracked and received in good time. Rated 5 out of 5 by Daisy41 from Great features This watch is an excellent choice as a running watch and daily step count. Keeps you active and motivated. It also tracks your sleep and heart rate. Would definitely recommend this watch. Rated 5 out of 5 by Armunro23 from Excellent value I got this to replace my Garmin Forerunner 610 as it had started to struggle with charging. I didn’t want to spend more than £200 and this came in with £40 change. This picks up GPS in a flash and is light and very comfortable to wear. I have a pretty small wrist but the strap is a good length and doesn’t flat around at all. The function to sync to my phone in seconds rather than having to upload is great and the heart rate function is as accurate as the chest strap. The display is much clearer than the 610 I had which is a real plus. Delighted with this purchase, would recommend to anyone looking for a good solid GPS watch. Rated 5 out of 5 by Amberlion355 from I love this watch Multifunctional, adaptable and durable. I wear this all day, every day. I have an analogue watch face via the app, which also displays the date, battery % and steps. I use it to log all activities I do, and it syncs to Strava as well as Garmin. It lets me set goals for daily steps and enter into a challenge for weekly steps to aid motivation. Battery life is good and the app is really detailed with lots of motivational incentives. Cons: it is bulky and the strap is annoying. I can live with these things on balance, but I do hope that Garmin will address them over the next few years, in time for when I’m able to afford to upgrade. When do you expect to have this in stock? Thanks. Hopefully by mid-December, hit the 'Email when in stock' button and we'll let you know when they arrive. Does this watch record cycling and swimming or just running? Can you set a vibration alert say every mile/km whilst out running? yes you can - there is an auto lap feature on the watch that can be changed between time or distance (either KM or miles). When is this expected in stock? Do I have to have my phone with me while running or can I leave it at home? Also how do charge this up? Does it come with a charging plug? If you want to use the message notification features you will need your phone on your person but for just tracking your run you do not need this. We hope this helps. will the watch work with a polar chest-strap for hear rate? Could I use this for an indoor swim on other activity? can it measure open water swims? You can measure the distance by calibrating the strokes, but I'm afraid the GPS doesn't work under the water. Can this work in Africa? I can't speak from experience, but I think it should. It uses GPS for location, and that should work anywhere. When you go to a new place it takes a little while to get a GPS fix the first time you use it, like maybe a minute or two. Can the 235 display heart rate as percentage of max heart rate? I like to run with my HRM displayng the percentage of my Max Heart rate so I can run in that zone... Thank you. This can only display the heart rate as the total number rather than the percentage unfortunately.